Hydraulic Pump….What Is This Thing? I was visiting an old defense plant to prepare a price for modification of a pre-1950 fire sprinkler system. While walking through the building, the sprinkler system in the picture caught my eye. 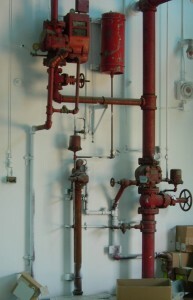 I recognized the six inch alarm valve, which has not changed that much over the years. I also identified the 2 ½ inch “Rate of Rise” Automatic of America mercury check actuated deluge system located in the upper left in the picture. But my question was “what is the device to the left of the alarm valve? After returning to the office I did some research and found the device in an old “Automatic of America” volume II book page G58a. The mysterious component turned out to be a hydraulic air pump Using a controlled flow of water from below the alarm valve, a venturi and other devices, water and air develops 24 ounces of air in the tank to the right of the deluge valve. In the process, the air is separated from the water. A control device opens the water flow at 16 ounces and stops the flow at 24 ounces of pressure. The 24 ounce air supply is instrumental in operating the mercury check and “rate of rise” heat detectors to activate the deluge valve. The “Hydraulic Air Pump” was installed in explosive environments to eliminate the possibility of sparks generated by electric pumps. I never cease to be amazed at early technology that was utilized in fire protection systems from the past.